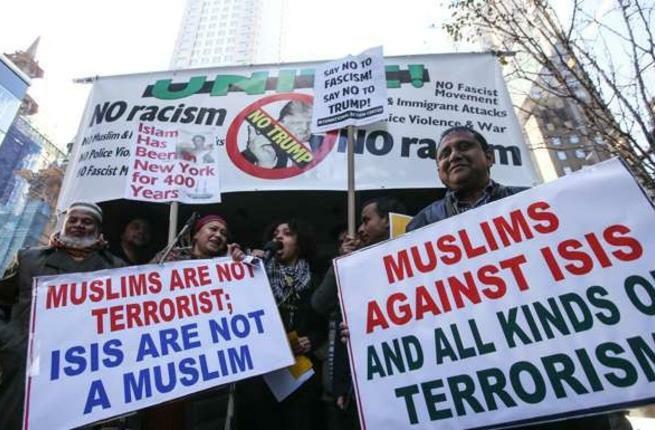 LONDON: Millions of Muslims around the world gathered to commemorate the seventh-century killing of the Prophet Mohammed’s grandson, thousands of which used the Ashura event as an opportunity to stand against terrorism at a time of increasing Islamophobia. 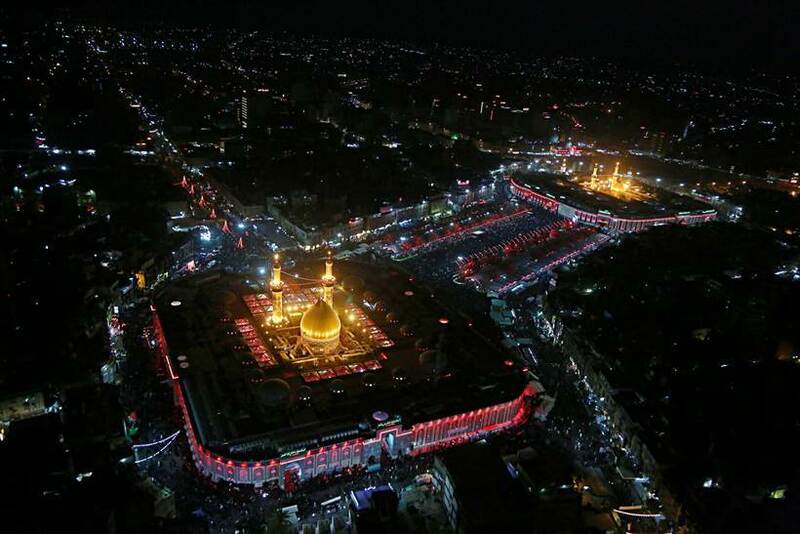 Pilgrims flocked to Karbala, where Hussain ibn Ali was killed by the forces of the Caliph Yazid in A.D. 680 – a formative event in Shia Islam. Some 25,000 members of Iraq’s security forces were deployed to protect the pilgrims, who in the past have faced attacks from ISIS and other extremist groups. Ashura is the tenth day of the Muslim month of Muharram and is preceded by nine days of mourning, Islamic lectures, and narrating the story of Hussain and his 72 family members and companions – all of which were killed or imprisoned in Karbala, modern-day Iraq. Similar events took place around the globe, including neighboring Iran and Lebanon as well as the British capital, where thousands of Londoners gathered to mark the event with anti-ISIS slogans. “ISIS will lose, love will win” and “We stand united against terrorism” were just come of the placards to decorate London’s streets, where the militant group has claimed responsibility for a number of attacks in the past few months alone. 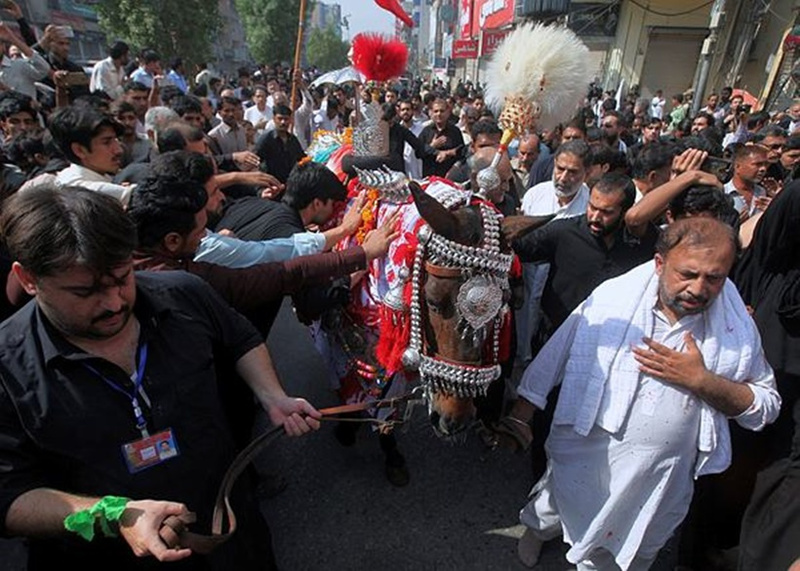 Youm-e-Ashur, the tenth of Moharram, was observed across the country on Sunday with due respect to pay homage to the sacrifices rendered by Hazrat Imam Hussain (R.A) and his companions in Karbala. Zuljinah, Alam and Taazia processions were taken out in all the cities of the country where Ulema and Zakireen highlighted teachings of Hazrat Imam Hussain (R.A) and the various aspects of the battle of Karbala. 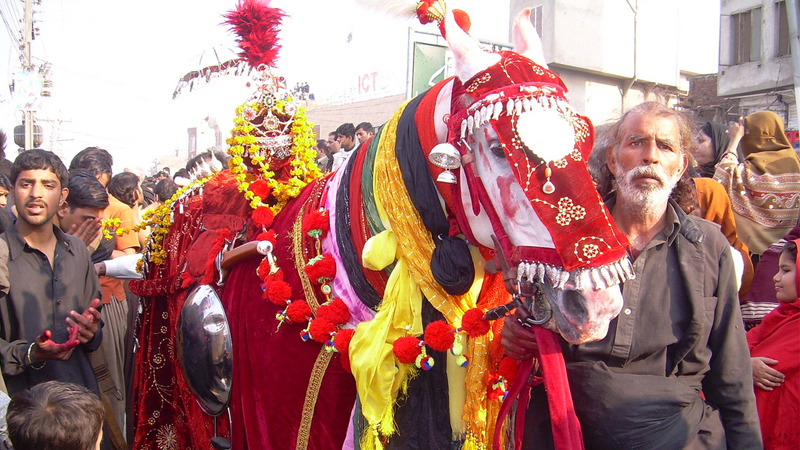 Fool-proof security arrangements were made across the country and especially on procession routes to avoid any untoward incident. The Muharram-10th procession – Youm-e-Ashura – was observed peacefully here by the community, with a procession heading out from central Wedding’s Koloniestraße area and concluding at the Minhaj-ul-Hussain Berlin community centre. Attendees recited nohas, mourned, and beat their chests during the procession, recalling the supreme sacrifice of Hazrat Imam Hussain bin Ali (AS) – the grandson of Prophet Mohammad (PBUH) – and his companions for the sake of Islam, humanity, and justice. Hazrat Imam Hussain (AS) and his companions achieved martyrdom at the hands Umayyad ruler Yazeed ibn Muawiyah’s forces for not surrendering to his caliphate. Speaking to Geo.tv here, Maulana Abrar Hussain Naqvi shared the reasons why Hazrat Imam Hussain (AS) sacrificed himself and his loved ones, highlighting how he chose not to bow his head to Yazid and, instead, preferred dying and stay true to Allah. The journey that Hazrat Imam Hussain (AS) and his companions undertook to Karbala and their sacrifice reveal the triumph of good and justice over evil and injustice, Naqvi added. A huge number of women partook in the march, sharing their thoughts on the concept of Karbala and paying homage to Hazrat Imam Hussain (AS) and his companions. Muslims of Pakistani, Afghan, Lebanese, and Syrian descent — from all corners of Berlin and other German cities – participated and conveyed their solidarity to Hazrat Imam Hussain (AS). Naqvi also shed light on the importance of Karbala from a historical perspective in the context of both Islam and mankind. 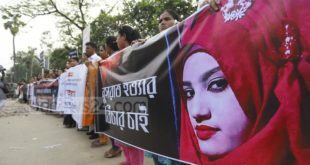 The Sham-e-Garibaan was also held, with people carrying candles in their hands and wearing black clothes. Participants made prayers for the unity and brotherhood among all humans, as well as for those oppressed around the world. 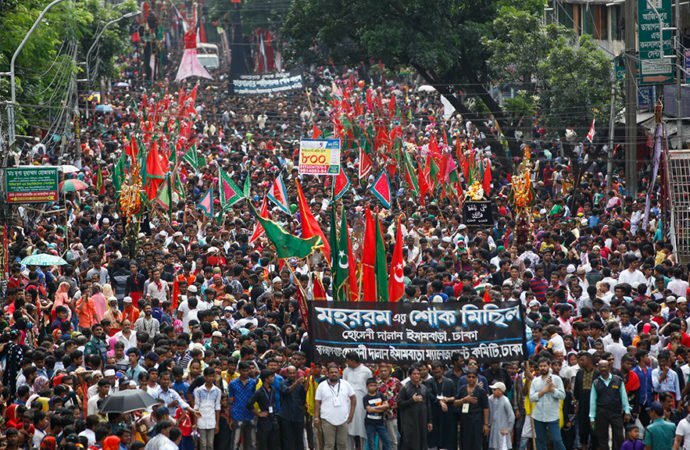 Muslims in Bangladesh as elsewhere in the world observed the holy Ashura on Sunday marking the 10th day of Muharram with due religious solemnity and in a befitting manner. The day was observed as a symbol of “sacrifice and mourning” recalling the martyrdom of Hazrat Imam Hussain Ibn Ali (AS), a grandson of Prophet Hazrat Muhammad (PBUH), in the battle of Karbala on the 10th of Muharram in Hijri 61. In the historic battle, Hazrat Imam Hussain (AS) along with 72 of his followers were martyred by the soldiers of Yazid at Karbala while fighting for establishing truth and justice in society. The word Ashura means simply “tenth” in Arabic, and therefore the name of the remembrance, literally translated, means “the tenth day”. 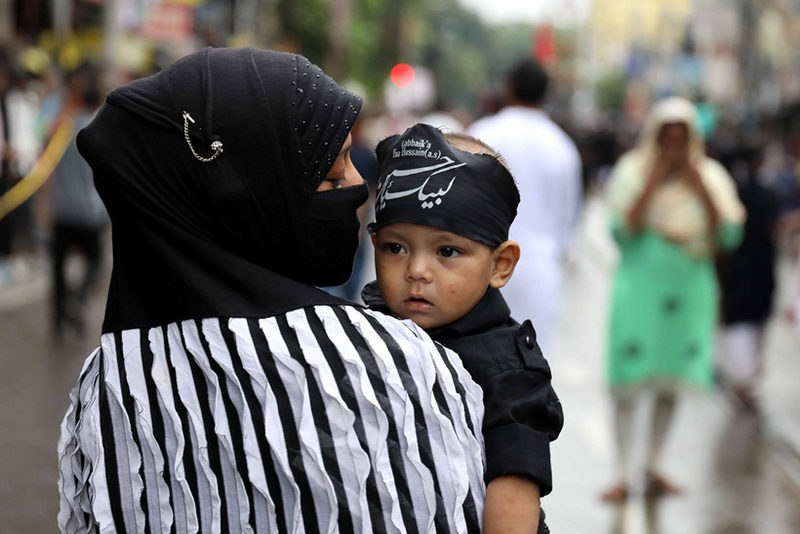 Muslims on Sunday observed Ashura, the 10th day of Muharram, across India with solemness. Muharram, the first month of the Islamic calendar, reaches a crescendo on 10th Muharram, the day when Imam Hussain Ibn Ali, grandson of Prophet Muhammad (Peace be upon Him), and his followers were martyred in 61 Hijri or 680 CE at Karbala, in present-day Iraq. 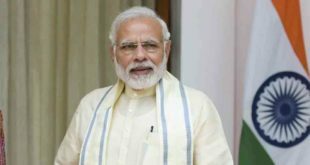 Processions carrying tazias and black flags with people beating their chests in ceremonial mourning were taken out across India. Amid cries of “Ya Hussain” and recitation of marsiyas (elegies) and noha-khwani (poems expressing sorrow), mourners used knives, blade-encrusted chains and other sharp-edged weapons to flagellate themselves to show solidarity with the sufferings of the martyrs. Hyderabad’s Shia community took out Muharram procession from Bibi Ka Alawe, the holy platform for Hyderabadi Shias. The procession started from Bibi ka Alawe to reach Chanderghat. 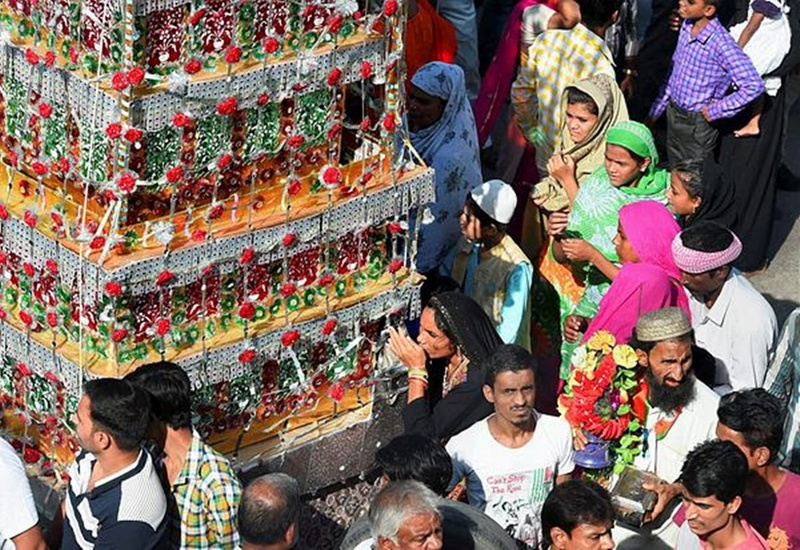 A caparisoned elephant carried the historical Bibi-ka-Alam during the Muharram procession near Charminar. The procession passed through parts of the old city, with thousands of people, irrespective of religion and caste, standing along the roads to pay their respects. With about 200,000 Shias, Hyderabad is home to the second-largest Shia community in India, after Lucknow. 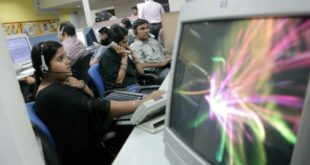 West Bengal on Sunday peacefully observed Muharram amid the apprehensions and concerns for any untoward event. 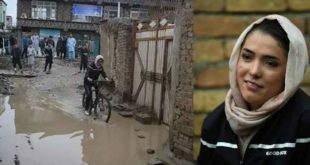 Thousands of Muslims participated in processions on Sunday braving the rains on the occasion of Muharram.